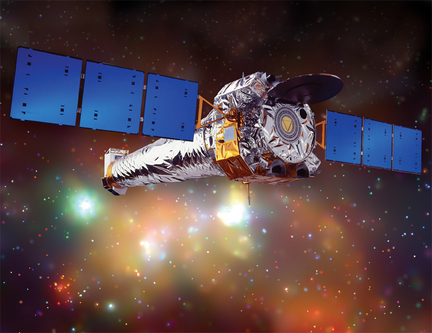 The Chandra X-Ray observatory scans the abyss with a very powerful X-Ray telescope that can see hundreds of times more clearly than any other telescope ever made. It was Chandra that saw the crushed star left by a supernova when the vessel was observing Cassiopeia A.
Viking 1 was the first man-made object to land on Mars without failure, following 2 Soviet probes that landed, but didn't stay operational for long. The Viking was responsible for sending color pictures of the red planet back to NASA and currently has the longest Mars mission under its belt - 6 years and 116 days. 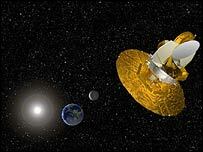 The Wilkinson Microwave Arisotropy Probe was launched in 2001 to measure the temperature of radiation left after the Big Bang. It is also responsible for using the post-Big Bang radiation to narrow down the age of the universe - the current estimate is 13.7 billion years. The famous moon landing of 1969 that made Neil Armstrong and Edwin "Buzz" Aldrin the first humans on the moon. To make things better, they brought back some moon rocks which allowed NASA to study what the moon was made of and its age.